Over the past 25 years, Pentecostals and charismatics seem to have lost their distinctive--the experience known as the filling or baptism in the Holy Spirit. The seeker movement has caused many to think that the work of the Holy Spirit in the context of worship as outlined by The Apostle Paul in 1 Cor. 12 & 14 is embarrassing and alienating to pre-Christians (unbelievers) who come to visit a church. Is this correct? The mission of the Church is to partner with the Holy Spirit to continue proclaiming Jesus' words, and doing his works until Jesus returns. The Holy Spirit is the source of power, and brings the presence of God into a church service. The best marketing efforts and planning of human beings that go into a church service will not produce what the hearts of men are seeking most--the tangible presence and experience of God. 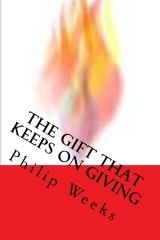 Retired CEC Bishop Philip Weeks has assembled a lifetime of teaching on the Holy Spirit into a new book called "The Gift That Keeps on Giving." If you want to learn the basics about experiencing the empowerment ministry of the Holy Spirit described in the Scriptures, I highly recommend this book! At St. Patrick's Church, the Holy Spirit is Lord, and we expect and welcome the presence of the Spirit and the gifts he brings for us in our worship. Contrary to Pentecostals abandoning the gifts in worship, we welcome you Holy Spirit! Come Holy Spirit, come! 4 There are different kinds of spiritual gifts, but the same Spirit is the source of them all. 56 God works in different ways, but it is the same God who does the work in all of us. There are different kinds of service, but we serve the same Lord. Today in our parish council meeting, we were discussing what are the differentiators that make our church different in the local church landscape in Buffalo. One of our ministry leaders mentioned that her husband had searched on Google for "convergence worship" and we did not show up. Convergence worship is why I left the Vineyard churches to launch this new adventure called St. Patrick's Church. In the weeks to come, we hope to share the passion we have for convergence worship which is what we do every Sunday! A classic article by our friend Archbishop Wayne Boosahda "The Convergence Movement." Here is a great article that captures our theology of why we baptize the children of believers--"A Contemporary Reformed Defense of Infant Baptism." Fr. Kevin's teaching at The Way Christian Community in Buffalo tonight was postponed due to the lake effect snowstorm. Will be rescheduled. A great talk given at Liberty University convocation by Douglas Gresham. He is the stepson of C.S. Lewis, and the maker of the Narnia series of movies. Lots of great nuggets of truth in a very funny talk. For day to day items of interest, check out St. Patrick's Facebook page. See you there. Fr. Kevin is speaking at The Way Christian Community, 65 Cherry Street in Buffalo, NY Thursday 1/19 at 7:00 p.m. I will be speaking on "The Bishop Our Shepherd." If you have been attending St. Patrick's, and are interested in learning about church membership, the basics are all who attend and receive communion each week are considered both baptized and communicant members. If you would like to serve as a ministry leader, or pursue holy orders we require that you be a confirmed member. If you desire to be confirmed in your faith, or received as a confirmed member of the church, please contact Fr. Kevin. A membership certificate is given to all who are confirmed by a CEC Bishop at St. Patrick's or received into our communion. A. A Baptized Member is one baptized in water in the name of the Trinity who maintains fellowship in a particular congregation and who is enrolled in the parish register. B. A Communicant is a Baptized Member who regularly participates in the life of the congregation, including sharing in the sacraments. C. A Confirmed Member is a Communicant who has been confirmed by the laying on of hands of a Bishop in the Charismatic Episcopal Church, or has been received by a Bishop of the Charismatic Episcopal Church, having been previously confirmed in a communion in apostolic succession. Only confirmed members may hold canonical offices. 5. A commitment to the Great Commission and the Great Commandment.